Learning how to play the trumpet is a wonderful, exciting experience. Trumpets, however, have a reputation for being very difficult instruments to play. The breath control alone can deter a budding musician. This is why it’s important to choose a student over a professional trumpet. The best student trumpets cater to the learners. The question of “where do I start?” might be a daunting query, and that is why we’ve done the research for you. In this article, we have compiled a must-read review of the top-rated and top 10 best student trumpets of 2019 including which brands and models to look for. You’ll also learn what a reasonable price-point is, 5 essential buying tips, the difference between professional and student trumpets, and what we believe your best option is when it comes to making your final decision. We are also going to cover the brands you want to look out for – the ones that are made to last. Let’s start with our student trumpet review. The Medini MTT-L trumpet by Cecilio has strong valves and a powerful, accurate sound. For its incredibly low price point, it can surprisingly last for years if properly cared for. What we like about this particular instrument from this brand is its ability to sound more expensive than it is. It’s not quite as sturdy as others on the market, so it’s probably not the best one for band practice or school. The fact that this trumpet doesn’t easily fall out of tune makes it ideal for younger children. They may not have the motor skills to learn how to tune their instruments yet. In a lot of music classes, very young children aren’t taught to tune their instrument right away. It also comes in six vibrant colors – a fun feature for kids. You’ll also receive a hard case, a 7C mouthpiece, gloves, a bottle of valve oil, and a cleaning cloth. If you’re looking for a long-lasting beginner’s trumpet at a comfortable price point, this is a great choice for you. This is one of the best student trumpets for the young beginner. It’s also great if you’re looking for a cheap student trumpet. The Jean Paul USA TR-330 is one of the best ones out there for beginners. The price point is slightly higher than other beginner instruments, but for good reason. This trumpet has a track record of tonal accuracy, sturdy valves, and a strong construction. Strong construction is important if your little beginner is playing the trumpet in his/her school band. The amount of wear and tear that comes with multiple performances and the hustle of other students can be brutal. Thankfully, the TR-330 can withstand that kind of traffic. All Jean Paul trumpets come with a carrying case, valve oil, and a 7C mouthpiece. This model also has a 1st valve slide thumb saddle and a 3rd valve slide with an adjustable ring and slide stop. These features are important. They allow the player to practice for longer periods of time without feeling as much hand fatigue. 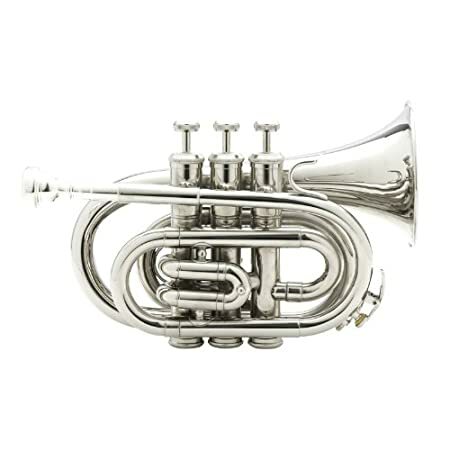 The Glory Brass Bb Trumpet is one of the lowest-priced beginner trumpets out there. If your little one decides that he/she doesn’t want to play anymore, it’s not going to break the bank to resell it or put it in storage. One of the biggest tricks of getting kids to practice is getting them a “cool-looking” instrument. This trumpet is sleek and comes in a large variety of shiny colors – sure to make any child swoon. Another benefit is that it comes with a care kit, which is made up of valve oil, cleaning cloths and gloves, and a nice little carrying case. The tonal quality is not the best, which is something you may want to consider. You can always move up to another model if your child decides to continue. If you’re looking for fantastic quality trumpet, this may not be the best one for you. But if you’re looking for something that your child can start with to see if he/she likes it, it’s a good choice. If you’re looking for a high-quality beginner’s trumpet, this one is perfect for you. With a professional bell and a rose brass lead pipe, this instrument has nearly perfect intonation. It also has stainless steel valves, something that is rare for beginner’s trumpets. The stainless-steel valves help to keep the trumpet strong and resistant to corrosion. 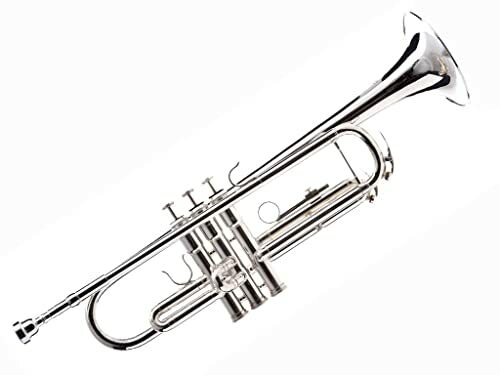 The LJ Hutchen Bb Trumpet is the perfect instrument to take to school and to band practice because of its durability. This trumpet is ideal for committed students who have played for at least a year or two. It is suited more towards older children in middle and high school. This isn’t to say an adult beginner wouldn’t benefit from this instrument. On the contrary: the quality will be more than sufficient for the adult beginner as well. It is on the higher end as far as price is concerned, but the manufacturers offer a rent-to-own option. We would highly recommend this trumpet because it will last. You won’t be replacing it any time soon. Pocket trumpets are considered a novelty by many musicians. The compact size makes them ideal for travel, but not so ideal for sound. Unfortunately, pocket trumpets tend to have a thinner sound than their other trumpet counterparts. This doesn’t mean they’re useless. Quite the opposite. While they may not be ideal for professional musicians, they’re great for kids or beginners. The small size makes them easy to transport to and from school. The Mendini MPT-N Nickel Plated Bb Pocket Trumpet is a great piece to start with. It comes in five bright colors and it’s laden with white faux mother-of-pearl buttons. It’s a very visually striking instrument. Along with the standard accessories like the case and cleaning cloths/valve oil, this pocket trumpet also comes with a Cecilio 92-D chromatic tuner. We would recommend this instrument for children who want something that’s a little different and fun. This trumpet will most likely be the most appealing for young children because of its size and its unique aesthetics. This trumpet is perfect for both beginning and mid-range students. It works for both children and adults. The Mendini MTT-30CN Nickel Plated Intermediate Double-Braced Bb Trumpet has a truly advanced sound quality. This is mainly due to its monel valves, which are sensitive and responsive, and its adjustable 3rd slide lock. These features make for a trumpet with accurate intonation. The care kit that comes with the Mendini MTT-30CN is also quite extensive. The downside of this particular instrument is that it doesn’t have the sturdiest of valves. Because of this, customers have complained about broken or sticky valves and imprecise tuning. These defects aren’t standard, and it’s rare when a trumpet is delivered like that. This is not something that would deter us from buying the instrument. Valves can be properly cared for to avoid this. One of the things we love about it is the case it comes in: its quality is even better than some of the $50-$70 cases that are out there. By far, the best thing about this product is the valves. They are durable piston valves, which aids in fluid motion and makes for a very long-lasting trumpet that sounds fantastic. Because of the way they’re constructed, oil doesn’t leak from them and they don’t get sticky. The Jean Paul USA TR-430 Intermediate Trumpet also has an adjustable 3rd trigger, which helps with natural hand positions. This is great for people who play for long periods of time, like intermediate-advanced students. This is going to reduce hand cramps if you’re practicing for hours on end. There have been a few complaints from customers that the case that comes with this instrument isn’t as strong or long-lasting as they’d like. This is an easy fix. If the case doesn’t work for your needs, you can always upgrade. This particular instrument is classified as a top trumpet for intermediate-advanced students. We might go as far as to say the quality is so excellent that it would work for some professionals, as well. This is one of the best trumpets for intermediate students. This is a solid choice for students who are younger but have a few years of experience under their belts. While the Hawk WD-T313 Bb Trumpet has a fairly strong construction, it requires quite a bit of maintenance. Remember that it is silver-plated and not made of silver. It is constructed out of brass. The valves need oiling regularly. We like the silver-plated feature because it makes for a beautiful instrument in all colors. While the sound is slightly off, it still packs a punch for the price. The valves are reliable, as well. As long as they’re cared for with oil and the instrument is maintained, there shouldn’t be issues with them. What makes this one of the best student trumpets for kids is that it also comes in a myriad of colors. The Hawk WD-T313 is manufactured in China, which could present an issue if you needed to replace parts. The parts you need will not be as easily accessible, and you won’t be able to get them as quickly as you would if it was made in the U.S. This trumpet is 100% universal for students of all ages and experience levels. Its incredible sound is not comparable to any others. This is due to the advanced design and construction. 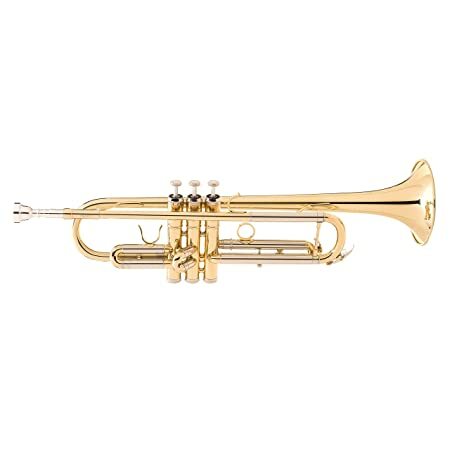 The Yamaha YTR-2330 Standard Bb Trumpet has a strong, lightweight bell made of yellow brass to encourage good technique for any student. The valves are made of a practically indestructible monel alloy. The classy valve buttons add an even more beautiful element to it. This Yamaha student trumpet is a favorite not only among band teachers and parents, but among the professionals in music sales, as well. It has a gold lacquer finish and comes with a hard case and a standard 7C mouthpiece. The small downside is the price. 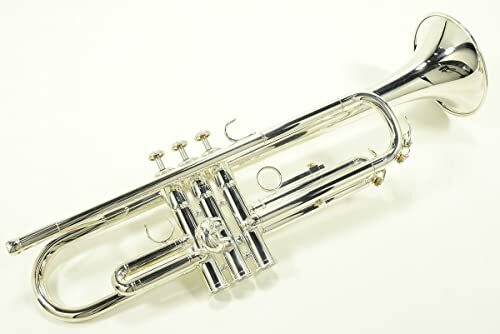 When you’re looking at the best student trumpets out there, it is possible to find a trumpet with adequate sound and weight with a smaller price tag. Especially when you’re talking about getting something for a beginner or student. That being said, this instrument was built to last. While this is one of the pricier products in this review, it is classified as a student model. A step up from the previous model, the Yamaha YTR 2330S Bb trumpet has a lighter bell (123 mm), making it easier to hold up for longer periods of time. This is ideal for the students that spend hours upon hours practicing at a time. The valves are also constructed out of a stronger alloy than the previous model. It is important to get a strong case for this instrument because of its weight. 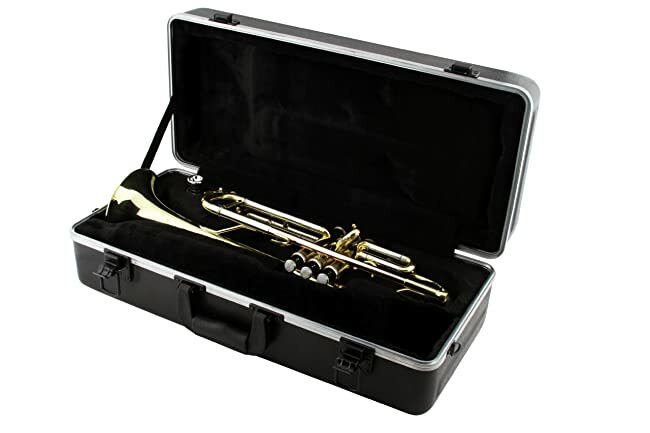 Lightweight trumpets require semi-hard or hard cases. Both will work fine. 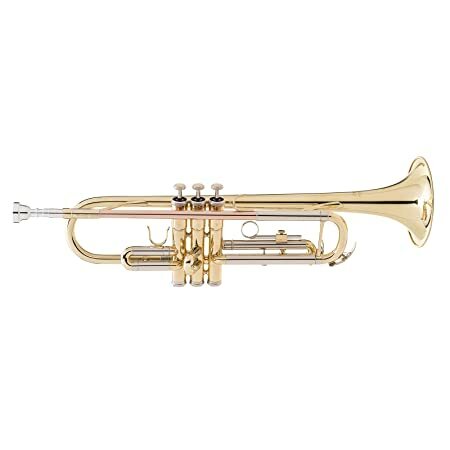 In comparison to the other trumpets in this review, the 2330S is the classiest and has the most advanced design. It isn’t the most durable, but it’s the longest lasting and the easiest to play. When you’re researching which trumpet you’d like to purchase, there are some important things to keep in mind. Resist any need to spend everything in your wallet. It may be tempting to buy yourself or your child a “fancy” trumpet that will last for a lifetime. But when you’re looking into buying a trumpet for a student, this isn’t something you want to do. You need to be sure this is something you like and want to play long-term. Keep the bore size in mind. The bore size is an important factor in student trumpets. A typical bore should be .458” to .460”. Larger bores can mean heavier trumpets – not ideal for beginners. They also require a lot more effort to play. The best student trumpets will have the correct bore size. Know what you’ll be using your trumpet for. If the trumpet you’re buying will be primarily for private music lessons, it may be okay to go for one that isn’t as sturdy as some of the others. After all, you’ll only be taking it to and from lessons. If you’re buying a trumpet for a student playing in a school band, you’ll need something that can take a few hits. When buying for a child, go for something fun. It’s hard to get kids to practice. Between school, homework, and a social life, it takes real motivation. One of the best ways to keep them motivated is to include them in the buying process and let them pick their favorite color. Stay away from the trumpets that require too much maintenance. The last thing you want to worry about when you’re learning a new instrument is fixing it all the time. Pick a brand and model that is known for its durability and reliability. Make sure and take a look at the trumpet reviews before buying. How Much Should You Pay for a Good Student Trumpet? As mentioned earlier, it’s important that you don’t break the bank when you’re buying a trumpet for beginners. For one, you don’t know how long the interest will be there. Two, if you’re buying a kid’s trumpet, you don’t know how much of a beating it will take. And three, if you’re looking at something over $500, it’s probably not meant for students. The exception for this would be the Yamaha trumpets in our reviews, but those follow the student guidelines of bore sizes and bell weights. It is perfectly reasonable to assume that spending $100-$300 on a beginner trumpet is your general price-point, even if you’re in search of the best trumpets available. If you have a small budget, it is very possible to find a trumpet around $100 that will be just fine for beginners. There are a couple of those in our reviews, including the Mendini by Cecilio (standard and pocket) and the Glory Brass. Something else to keep in mind is whether you’re buying for a beginner student or an intermediate student. The intermediate trumpets are pricier, but they have a wider range, allowing the student to advance even further. What Are Good Student Trumpet Brands? When you’re looking at the top brands for trumpet students, the first brand that comes up is typically Jean Paul. Jean Paul is one of the industry-leading brands because of their reliability. Their quality standards are extremely high, and they check and re-check all trumpets before they send them out. This means your chances of getting a faulty trumpet out of the case are slim to none. Jean Paul models also have some of the best trumpet reviews. The Jean Paul USA TR-430 model in this review has one of the strongest piston valve sets out there. It’s a good one to keep in mind. While valve oil can certainly fix the occasional sticky valve, it isn’t meant to fix valves that are faulty. When buying any brand, looking at the valve strength and reliability is a must. You can’t go wrong with either of the two Yamaha models in this review, we would recommend them as intermediate trumpets as opposed to beginner trumpets. The most popular beginner student trumpets would be the Mendini by Cecilio. These trumpets are extremely inexpensive and durable. While their intonation isn’t as good as the Jean Paul or Yamaha brands, they are perfect for beginners. This is a very good option, and it is considered to be one of the best trumpet brands. What is a Good Trumpet for a High School Student? Assuming that your high school student has been playing for a few years prior to high school, you may be looking to buy up. For high school students who have been playing since middle school, we recommend buying an intermediate trumpet for them. This will allow them to work on fine-tuning their breath control and increasing their range. Because of this, we’d be looking at Jean Paul brands for high school students — specifically the TR-430 model. It is made of high-quality rose brass and the sound is clear and concise. It comes with a care kit and a hard case, making it great for traveling. The sound will carry in any setting, making it a good option for band practice and performances. Jean Paul is also known for the durability of their instruments. To top it off, should the instrument need repairs, parts are easy and inexpensive to replace or fix. 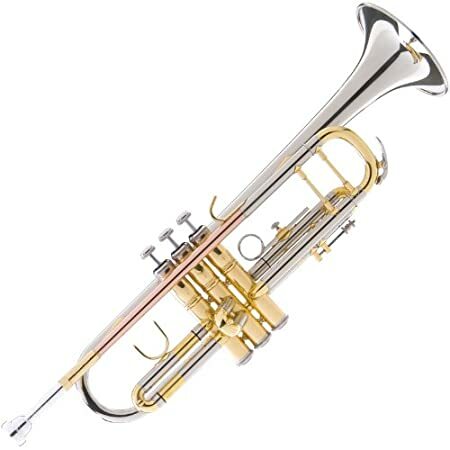 This model is our recommendation when it comes to the best trumpet for students. 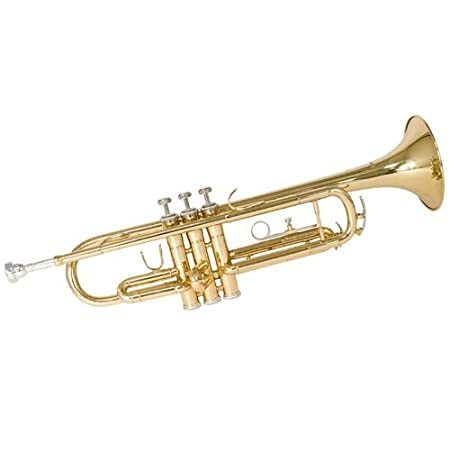 If your high school student is a beginner, they will need the same amount of durability but they won’t need an intermediate trumpet. Quite the opposite: if your high school student is new to the trumpet, you want to buy a beginner trumpet. More along the lines of the Mendini by Cecilio MTT-L or the Jean Paul USA TR-330. Always make sure to check the trumpet reviews. They are indicative of the quality of the trumpet itself. All three of these models excel in that department. What Are the Main Differences Between Professional and Student Trumpets? Contrary to popular belief, there is a difference between a professional trumpet and a student trumpet. For many instruments, you may be able to buy an advanced instrument for a beginner or a student. This is not the case with wind instruments like trumpets. The main differences are the bore sizes (larger bore sizes mean more breath exertion on the student’s part), what they’re made of (students trumpets are typically made of brass, rather than silver or gold), and how they sound. 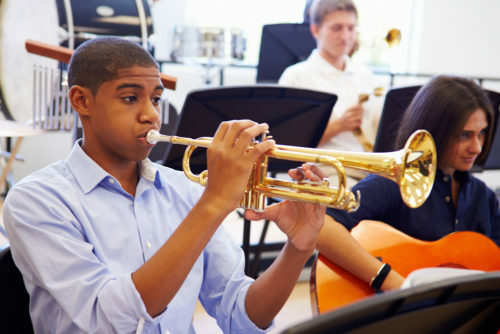 A student trumpet won’t reach the same range as a professional trumpet – but students won’t need the fancy trumpets that can reach multiple octaves and are made of gold. A heavier trumpet that requires more breath exertion can and will deter the beginner from advancing. A heavier trumpet is not recommended when you’re looking for the best student trumpets. 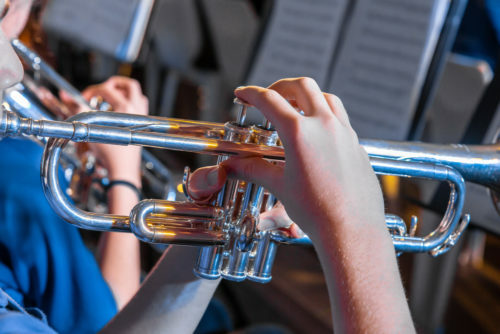 When talking about the differences between a beginning student trumpet and an intermediate student trumpet, a couple of factors need to be taken into account. An intermediate student doesn’t need a trumpet made of gold with perfect intonation and sound that resonates through professional halls, but he/she does need a trumpet that can reach multiple octaves. This means that an intermediate player might like a larger bore size. They might also prefer a heavier bell because their arm strength has increased through the years. Your top student trumpet will meet the weight specifications desired. What is the Best Beginner Student Trumpet? A beginner trumpet needs to be lightweight and it needs to have a small bore size. It also needs to be reliable so that the beginner doesn’t get frustrated with consistent repairs. A bonus for a beginner trumpet is precise intonation, and this is often difficult to find in the inexpensive beginner trumpets. For the best beginner trumpet, our suggestion is the Mendini by Cecilio MTT-L. 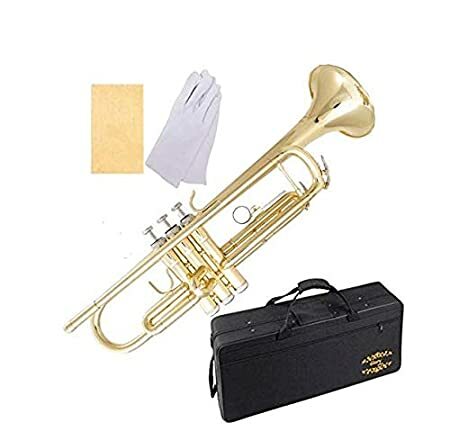 This instrument, with its extremely low price, is perfect for the beginner student who wants to figure out whether or not the trumpet is something they’d like to continue with. Its sound is incredible for the instrument’s quality. While it may not be as durable as the others, the sound and the price point make up for this. It also has a reputation for staying intact; it doesn’t need much maintenance. 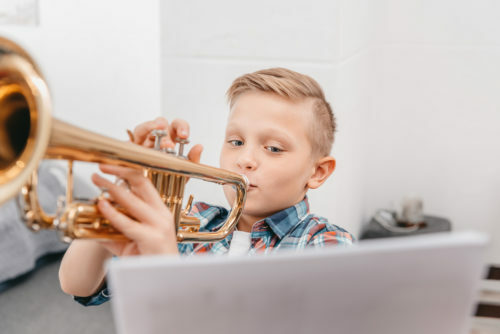 While it is not one of the best student trumpets for intermediate students, it is one of the best student trumpets for children that are beginners. The fact that it comes in 8 colors is a huge plus for kids, and it also stays in tune. Perfect for the young beginner who might take a while to learn how to tune their instrument. While all of the products in this review are great for students, nothing measures up for the best beginner trumpets (especially for the young beginner) like the Mendini Cecilio MTT-L.
mspot.com is a participant in the Amazon Services LLC Associates Program, an affiliate advertising program designed to provide a means for sites to earn advertising fees by advertising and linking to Amazon.com.